The third of three recent releases to make its way to us from Rocks Brewing is one that's been around, on and off, tweaked here and there, for a number of years. This time around, it comes in black and purple tins as part of the Conviction Series of releases, like stablemate Conviction Pale Ale. 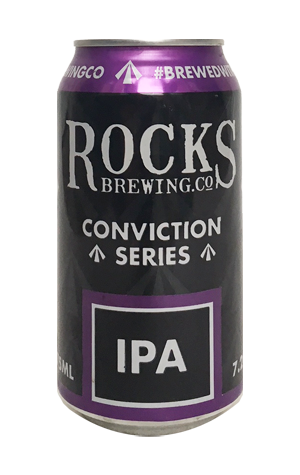 While the Pale looks to squeeze plenty of flavour into a mid-strength body, here the Rocks brewers have a full 7.2 percent ABV to play with. Like the Pale, it allows hops to take centre stage but, whereas the smaller beer opts for lighter citrus and pineapple characters, here they look to extract more intense flavours and aromas from the greenery. Look out for plenty of pine as well as dense dark berry and blackcurrant aromas and hop flavours that almost veer into liquorice territory in a beer that's reminiscent of the more aggressive IPAs coming out of the West Coast of the US a few years back than the flightier, more tropical sorts in vogue today.